“Tra”, a magazine of information, debate and cultural research with articles in both Italian and English was published 10 times over the years 1976 to 1979. 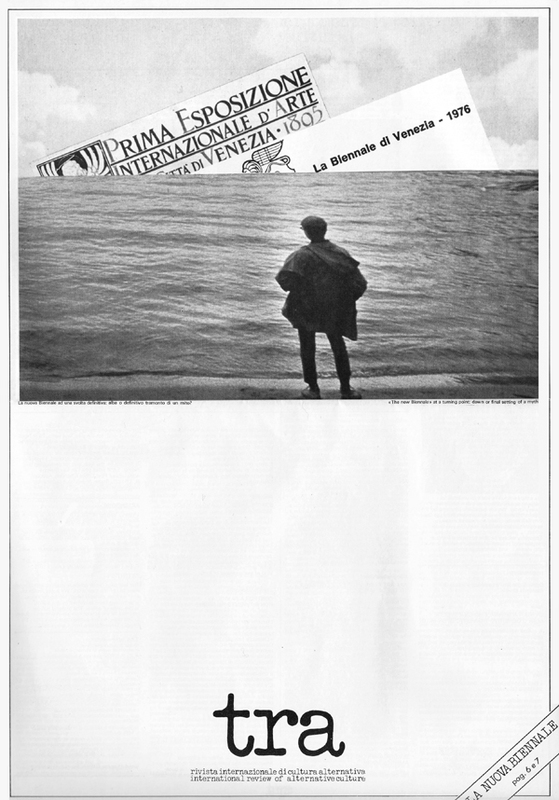 Issue number zero was printed on the 15th May 1976, on the occasion of the new version of the Venice Art Biennial after the protests of 1968. Right from its trial issue, “Tra” found major consensus amongst artists due to its cultural policy line denouncing the situation of the political/government takeover of the arts. Founder and editor of “Tra” Giancarlo Bocchi, who, although young, had already gained experience in art and art criticism through knowing and frequenting some of the most innovative artists of the time. The magazine sought to bring together information on the most intriguing experiences in art, theatre, the visual image and architecture through an ideological and philosophical analysis of the deepest raison d’être behind cultural and artistic research and the contentious relationships with the market and the “art system” Thanks to this, the usual writings on art were frequently accompanied by interviews with and contributions from many philosophers and intellectuals. The magazine fought on artists’ behalf to uphold the utmost freedom of expression and support radical research in order to counter all those impositions and degenerations due to the economic interests and prevailing fickle fads of the “art system”. It was a “political” or better, “polyptychal” magazine, i.e. with a wider-ranging vision, multifold dimensions, and an analysis of aesthetic research not merely as some spectacular, fashionable piece of information, but as a moment of cultural and political progress for society. Many times the articles published expressed a particular point of view on debate and research, but these opinions were not necessarily shared wholly or even partially by the editor or editorial staff of “Tra”. The texts and the photoes published on the site “Archivio di Tra” are the property of the Fondazione Bocchi www.fondazionebocchi.it and may be used only partially, citing the source and respecting the authors’ and others’ rights.